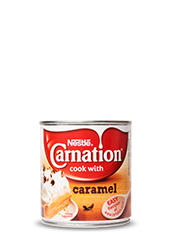 Whether you're making or baking, topping or mixing, the Carnation range makes family desserts easier than ever. 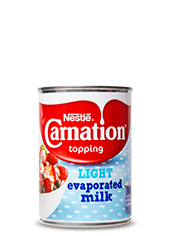 Made with skimmed milk, Carnation® Condensed Milk Light is a lighter*, fat free alternative with the same delicious taste. 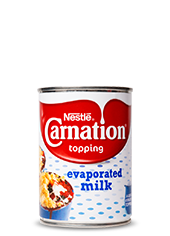 Like Carnation® Condensed Milk, it’s made with all natural ingredients. 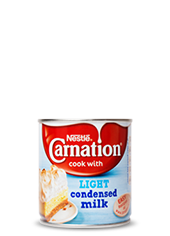 Carnation® Condensed Milk Light is available in 405g tins. 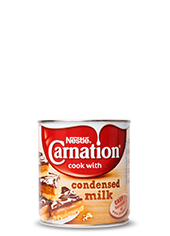 *Contains 98% less fat than Carnation® Condensed Milk. INGREDIENTS: Skimmed Milk, Sugar. Sweetened Condensed Skimmed Milk maximum 1% Milk Fat, minimum 24% Milk Solids not Fat. Portions should be adjusted for children of different ages. 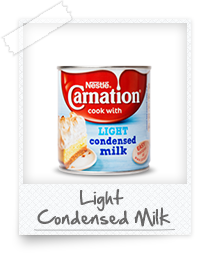 Condensed Milk Light is rated 5.0 out of 5 by 20. Rated 5 out of 5 by Chris50 from "Healthy" Millionaire's Shortbread! I bought the light condensed milk & my chocolate millionaire's shortbread are so tasty I'll definitely be making these again. Rated 5 out of 5 by Linda 773 from Great variety Made key lime pie . Delicious. Have made toffee cheesecake, goingto try carrot cake for Easter . Rated 5 out of 5 by Maggie17 from Feel good Tastes as good , but less calories with no loss of taste. Yummy! Rated 5 out of 5 by MagooBear from You won't be disappointed! 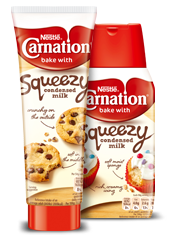 Use this a lot in baking particularly if I want something with less calories, and this is really great! It still tastes amazing and very sweet, I don't think you can tell the difference between this one and the non-light version! Great value for money too! You won't be disappointed! Rated 5 out of 5 by lotte321 from Still a great taste We are all supposed to be a little healthier these days, so I've recently switched to 'Light' carnation milk. If I'm totally honest, there is a difference in taste but not enough to put me off of buying it. Still does a great job for my needs. Rated 5 out of 5 by Sue04 from Great fudge I so happen to come across the fudge recipe through an email - easiest fudge I have ever made and the 'light' makes it a few calories less, so I can have an extra piece (or two). p.s. thanks for the fudge recipe too!